"Never approach, harass, or feed alligators. Remember they are wild animals and can move very quickly." This warning begins the Important Facts section of the National Historic Park and Preserve website for Louisiana's Barataria Preserve. Two hundred years ago, the same could be said for another group of residents of this southernmost stretch of Louisiana marshland and waterways, Jean Lafitte and his band of cohorts. Were they pirates, these men who made their homes in the narrow channels and marshes where the Mississippi River emptied into the Gulf of Mexico? History says yes, although Lafitte often argued he and the others known as the Baratarians were merely sailing men with Letters of Marque from the Venezuelan government entitling them to call themselves privateers. This license to hunt vessels from certain countries at odds with Venezuela meant nothing in the bayou, and yet it did provide at least some measure of excuse for these men to ply the brown waters of the Gulf. In league with such men as the Bowie brothers, one of whom--James--would die a hero at the Alamo, the Baratarians found success in providing citizens of New Orleans and points north with goods that otherwise might not be available. Where these goods originated, and whether their import was legal, were questions that were neither asked nor answered. Any questions on how these Baratarians managed their exploits is easily answered with one view of the land where they carried on their activities. Where exactly is this place that hid pirates and Englishmen alike during the days leading up to the Battle of new Orleans in 1814? Follow the Mississippi River past Baton Rouge and New Orleans, and the muddy water widens and rolls southward. Just before it empties into the Gulf of Mexico, it wraps around land that disappears with the tide only to reappear again when the water drains away. Before the advent of helicopters and speedboats, the only access many of the dwellers of the outer reaches of Barataria had was through ships sailing into the deeper channels and, failing that, the flat-bottomed boats called pirogues that could ply the narrowest and shallowest of streams. Even today, two hundred years after the Baratarians fled, or managed to hide deeper in the marshes as some legends go, there are places in these southernmost parishes that rarely see an outside visitor. The Barataria Preserve offers a glimpse into these untouched places where alligators outnumber residents and pirates once roamed. Or were they merely businessmen in the employ of a foreign government? That depends on who you ask. What is true, however, is that a trip to the Barataria Region of Louisiana will leave the visitor with a greater appreciation of what life must have been like for these hardy settles two hundred years ago. If you believe the rumors, you may even stumble across some of Jean Lafitte's bounty. After all, stories abound of treasure left behind by the Baratarians in their haste to flee. Stories including my new novel Millie's Treasure, that is. Bestselling author Kathleen Y’Barbo is a Carol Award and RITA nominee of forty-nine novels with over one million copies of her books in print in the US and abroad and nominations including a Career Achievement Award, Reader’s Choice Awards, Romantic Times Book of the Year, and several Romantic Times Top Picks. A proud military wife and tenth-generation Texan, she now cheers on her beloved Aggies from north of the Red River. Find out more at www.kathleenybarbo.com. I now want to visit the Barataria Region of Louisiana. It sounds fascinating! Thanks for sharing! This post was so very interesting. I can't imagine being in a place where gators might outnumber people. Thank you! It's a wonderful place to visit, even if you just have a few hours to drive through. Fascinating! I am adding the Barataria Preserve to our list of places to visit. 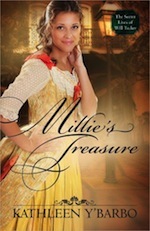 I can't wait to read MILLIE'S TREASURE! A trip to the Barataria Preserve sounds like an interesting trip. I'd almost think someone would have to be hiding to want to live in such a rugged environment--and they had no bug repellent back then. Interesting post - but I can't imagine living in a place where there are more alligators than people, one would be one too many for me. I can't even imagine living in the areas of Florida where I would have to be concerned with alligators coming onto my lawn, yet I understand that residents get used to it, & aren't bothered by it enough to move elsewhere. I love reading how people live/lived in different parts of the U.S. - I guess modern civilization has softened me, as it is hard for me to imagine living as the early settlers of so much of the U.S. did. I guess if I had never heard of an easier lifestyle, I would have been content, maybe? Just glad I can read about those people now, rather than experience their lifestyle. It's definitely a place worth seeing!